Design and Ammunition: How Many Bullets Does it Hold? Is the FN P90 Legal In The United States? Submachine guns, or SMG’s, are essentially machine guns which use handgun ammunition rather than rifle ammunition. 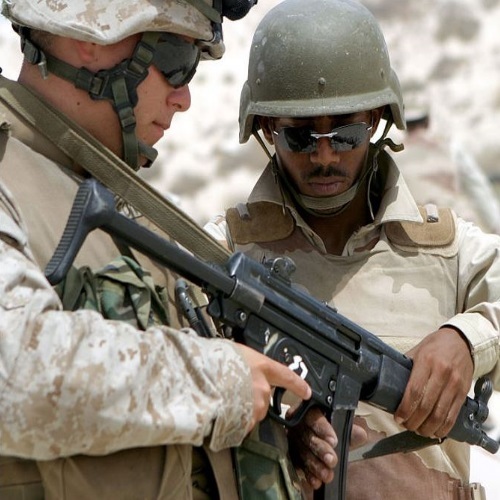 While it’s often said that the submachine gun is a more compact version of the machine gun, this isn’t necessarily the case – it would be more accurate to say that the submachine gun is actually a larger, more powerful version of the handgun. Submachine guns are not generally the most popular kind of firearm amongst civilians, but the FN P90 (also known as the FN Project 1990) is simply too special a gun to not warrant near-universal demand. 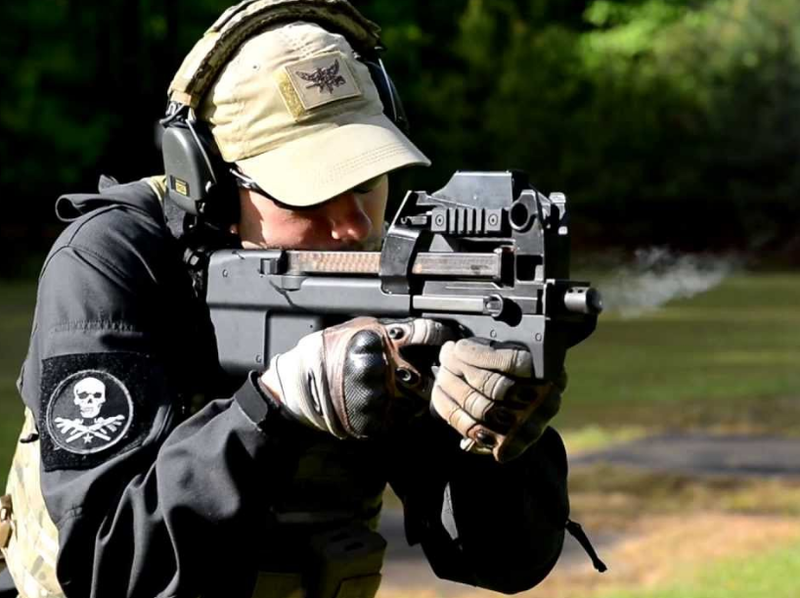 The P90 and its bullpup design look nothing like conventional submachine guns, or guns of any kind for that matter – it has a futuristic look that screams ‘cool’ and exciting features that we’ve come to expect from FN, a world-class firearms manufacturer. However, the P90, being an automatic submachine gun, is not available for civilian use, outside of in the Call of Duty series (note: I personally do not favor the P90 when playing COD due to the annoying and unrealistically lengthy re-load animations featured when using the gun). This left the regular gun-owning folk of the world on the outside looking in on the P90 party – that is, until the PS90 came along in 2005. A semi-automatic submachine gun, the PS90 mirrors the P90 in most ways (including its unique look) but is nerfed for the sake of legality and for commercial sale. This makes it an excellent choice for both personal defense and sporting uses for gun owners, and it comes as no surprise that the model has been popular ever since it was first released. What exactly makes the P90 (and the Ps90) such a damn satisfying firearm? We’ll cover that and more here in our FN P90 and PS90 Submachine Gun Review! Before we get into FN Herstal’s foray in the submachine gun category, let’s take a step back and examine the broader history of the SMG. 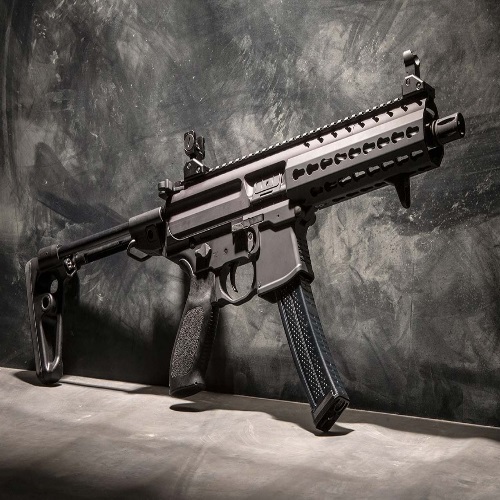 Originally the product of a demand for more powerful, lightweight guns, the submachine gun has seen decreased use, development, and demand in recent years. This is due to the rise of the assault rifle, which accomplishes the same job as the submachine gun but with greater stopping power and range. The golden age of the submachine gun, the World War 2 era, saw millions of SMG’s in use, but demand for the gun gradually declined as development continued across the entire spectrum of other gun categories, while the SMG remained limited by definition (SMG’s use handgun ammunition, there’s just no getting around that). 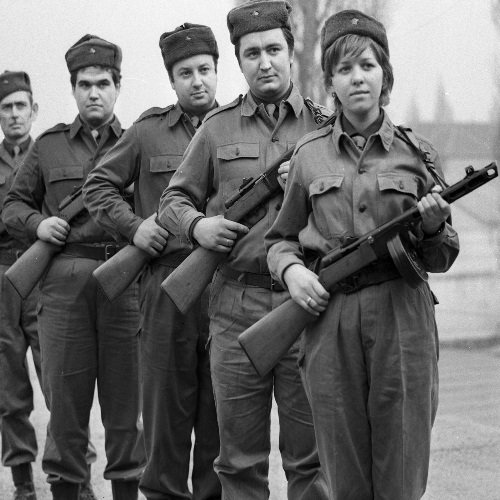 The submachine gun niche still does exist, thanks in large part to the militia and police officers who favor its advantage in close quarters as a handgun caliber weapon that doesn’t feature the same maneuverability limitations and kick as an assault rifle or a firearm of that sort. The new cartridge was requested to be capable of outperforming the 9x19mm in every way, including superior range, accuracy, and terminal performance along with the ability to penetrate body armor. Shoulder-fired guns of this caliber were to weigh less than 3kg while offering no less than 20-rounds of ammunition. Handheld guns using this new caliber were to weigh less than 1kg while offering no less than 20-rounds of ammunition. Both shoulder-fired and handheld guns of this new caliber were to be able to be carried hands-free at all times, and function in any environment, climate, or condition. The cartridge was to be as affordable as the 9x19mm, if not more affordable. FN took up the call before any other firearms manufacturer in answering NATO’s request, developing a small caliber 5.7x28mm cartridge. This was called the SS90 and went into production with the new P90 machine gun in 1990 (hench the ’90’ billing in the P90 name). Belgian special forces became the first military to employ the P90 during the 1991 Gulf War, to great effect – Belgium reported nothing but positives in regards to its P90 experience. FN shortly revised the design of this cartridge, introducing a new version of it that was 0.11 inches shorter and could better be used in a new handgun which would become the FN Five-SeveN. This cartridge, the SS190, was fully introduced in 1993 and has been regarded as a first-class cartridge ever since. In 2003, NATO decided to undergo a series of tests amongst 9x19mm replacement cartridges in order to standardize one. FN’s 5.7x28mm cartridge was the decisive winner of this ‘competition’, but Germany and a select few other countries with competing interests prevented the standardization of the FN cartridge. Nonetheless, FN’s new cartridge is widely regarded as the class in 9x19mm replacements, and the FN P90 is widely regarded as the class in submachine guns. FN P90/PS90 Design and Ammunition: How Many Bullets Does it Hold? Weight: 2.6 kg (5.7 lb) (P90), 2.85 kg (6.3 lb) (PS90). Length: 50.5 cm (19.9 in) (P90), 66.6 cm (26.2 in) (PS90). Barrel Length: 26.4 cm (10.4 in) (P90), 40.7 cm (16.0 in) (PS90). Width: 5.5 cm (2.2 in). Height: 21 cm (8.3 in). Action: Straight Blowback, Closed Bolt. Rate of Fire: 900 Rounds Per Minute. Muzzle Velocity: 715 m/s (2,350 ft/s). Effective Firing Range: 200 m (660 ft). Maximum Firing Range: 1,800 m (5,900 ft). Feed System: 50-round detachable box magazine. Sights: Tritium-illuminated reflex sight, back-up iron sights. As one can plainly see, the FN P90 has an ammo capacity of 50-rounds (well greater than the 20-round minimum outlined by NATO, one will note). This ammunition is loaded in a unique, top-mounted magazine. The ammo capacity is an impressive achievement from FN, given the lightweight and portable nature of the gun which, as previously noted, uses a unique and exciting design. The P90 uses a thumbhole in the frame in order to serve as a pistol grip, and a trigger guard foregrip for improved handling. The P90 is fully ambidextrous, and is billed by FN as the “first fully ambidextrous individual automatic weapon” – a shaky boast, but an impressive one if it is indeed accurate (the term “fully ambidextrous” is a bit of a grey-area in terms of which guns accurately fit under this definition). Above all else, the P90 is designed to be easily carried, weighing in at just 2.5 kg and using a rounded, contoured body which is designed to prevent the gun from getting caught clothing or equipment. The P90 is also intended to require minimal maintenance, as evidenced by its modular four-component group design. The P90 does not hold up as well in terms of ballistic performance as larger-caliber guns and rifles, although this is to be expected. In fact, it is the diminished chance of deadly force which makes it such a popular choice among certain law enforcement agencies. PS90 Standard: The current PS90 model available from FN, the PS90 standard uses a picatinny rail for easy accessorization and is available in either olive or black. PS90 TR: Now discontinued, the PS90 TR implements a “triple rail” receiver like the one found in the P90 TR. What “triple rail” means is the gun uses a standard picatinny rail, like the one found in the PS90 standard, as well as two side rails for even more accessorization possibilities. PS90 USG: Also discontinued, the PS90 USG comes equipped with an aluminum reflex sight housing. This sight is removable, and despite the gun being discontinued the USG reflex sight is still currently available as a standalone accessory. FN P90 – CQB (close quarter combat) weapon that fires a lethal bullet proof jacket defeating round. To reiterate, the FN P90 is not available for purchase. If you own one, it is either via working for the military or a law enforcement agency, or you have some explaining to do. The PS90, on the other hand, is very available. Pricing is generally dependant on the condition of the PS90 (new, used, wear and tear), but the price range generally falls from $1,200-$1,500. The MSRP from FN themselves is $1,449, but a used model from a third-party seller can always be found for cheaper. Ammunition is widely available due to the acclaim of the caliber and weapon, which means that despite it being specific by nature, ammo is not overly expensive or unreasonable in terms of price. FNH P90/PS90 Barrel Side Rail: Given that the PS90 TR has been discontinued, it stands to reason that the need for side rails on the P90 and PS90 needs to be satisfied. This side rail, which is developed by FN, does the job – color compatible with the black models and made for easy installation, try this model if you’re looking for a handy side rail. Assault Systems Discreet FN Case For FN P90 and PS90: While the FN P90 and PS90 are manageable, easily carried guns, for the sake of safe transportation of the guns across larger distances, or for storage, a case can be very useful. 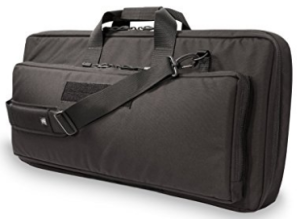 This Assault Systems Discreet Case does a great job of transporting your P90 or PS90, using high-quality double-row stitching and internal seams for high-quality security. FNH P90/PS90 Magazine Pouch: While the FN P90 is as straight-forward as it gets in terms of carrying, human beings only have so many free hands to carry things with. Carrying extra magazines can prove troublesome, but this FN Magazine Pouch helps lighten the load. Capable of carrying two additional 50-round clips, this magazine pouch by FN can strap around the leg or waist depending on your preference, and is as unobtrusive as can be. Ultimate Arms Gear Tactical Dual Red & Green Dot Scope: The FN P90 and PS90 are generally viewed as short-distance weapons due to their smaller caliber and size, but that doesn’t mean that some folks don’t like using a scope on them. Featuring a 30mm lens and red and green-dot options, this scope by Ultimate Arms is deadly accurate, reliable, and even comes with a lens cleaning kit to ensure clarity and quality. The bottom line is, the FN P90 fits a certain niche comfortably for gun owners. If you’re looking for a compact, concealed carry gun, this is not the gun for you. If you’re looking for a power-packed, stopping power machine, this is also not what you’re looking for. If you’re looking for a highly portable personal defense weapon that is unique in design, employs a high-quality, reliable cartridge, and achieves submachine gun billing, the P90 or the PS90 is the gun for you. Thanks for reading our FN P90 feature – check out some of our other great FN features like our Five-SeveN or SCAR reviews here at Gunivore!